Colgate. New breakthrough technology for whole mouth health. Fights bacteria on teeth, tongue, cheeeks, gums for 12 hours*. *with four weeks of continuous use. • The advanced technology of Colgate Total proactively protects your whole mouth, fighting bacteria on not just teeth, but also your tongue, cheeks and gums for 12 hours* # vs. non-antibacterial fluoride toothpaste. • Brush for 2 minutes twice a day or as directed by your dental professional. Rinse mouth thoroughly with Colgate Plax for 30 seconds. • New Colgate Total? 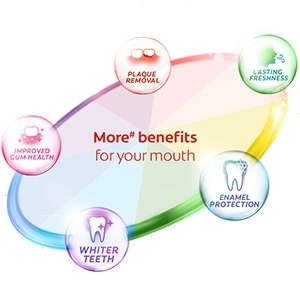 delivers a range of proven benefits for Whole Mouth Health, including positive effects on plaque, tartar, whitening & stain removal, fresh breath, cavity and enamel protection. 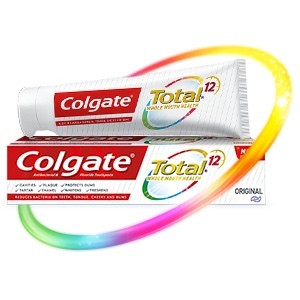 New Colgate Total Advanced Whitening Toothpaste reduces bacteria on teeth, tongue, cheeks and gums. 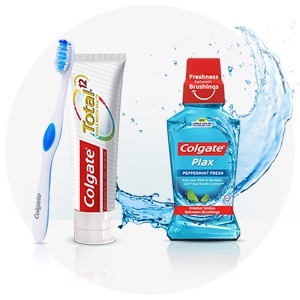 • Brushing with Colgate Total Toothpaste will help improve your teeth, tongue, cheeks and gum health. Glycerin, Hydrated Silica, Water, Sodium Lauryl Sulfate, Arginine, Flavour, Zinc Oxide, Cellulose Gum, Poloxamer 407, Tetrasodium Pyrophosphate, Zinc Citrate, Benzyl Alcohol, Cocamidopropyl Betaine, Sodium Fluoride, Sodium Saccharin, Xanthan Gum, Phosphoric Acid, CI 77891, Mica, Sucralose, CI 74160, CI 74260, CI 77492. Active Ingredients: Sodium Fluoride 0.32% w/w (equiv. to 1450 ppm F). Contains: Sodium Fluoride 0.32% w/w (equiv. to 1450 ppm F). Brush thoroughly at least twice a day or as directed by your dental professional. Do not swallow. Rinse with a small amount of water. Not recommended for children 6 years or less. Colgate recommends specially formulated Colgate children's toothpaste. Up to 12 hours of protection against bacteria with 4-weeks continuous use.